Objectives: The objective of this study was to correlate maximum standardized uptake value (SUVmax) with different immunohistochemical subtypes of breast cancer and other prognostic factors in breast cancer. Subjects and Methods: This was a retrospective study including 219 consecutive patients undergoing whole-body fluorodeoxyglucose positron emission tomography/computed tomography scan for the staging of breast cancer. Out of 219 patients, two were male and 217 were female; age ranged from 26 to 85 years with mean age of 54 years. On histopathological examination (HPE), 197 patients were of invasive ductal carcinoma type and two of lobular type. Histopathological grades, immunohistochemistry (IHC) types, and ki-67 values were compared with SUVmax values. Results: The mean SUVmax of the population was 11.39 (±6.05). The mean SUVmax in different HPE grades was Grade 1 = 6.81 ± 5.6, Grade 2 = 11.4 ± 6.12, and Grade 3 = 13.14 ± 5. The mean SUVmax values in different IHC types were Luminal A = 7.75 ± 4.2, Luminal B = 10.01 ± 5.3, triple negative = 15.26 ± 5.6, and HER2 enriched = 11.27 ± 5.2. The mean SUVmax in high ki-67 patients was 11.97 ± 5.85 compared with 7.25 ± 3.43 patients with low ki-67. Univariate analysis showed significant difference in SUVmax in patients with different grades (P = 0.013), hormone receptor positivity (P ≤ 0.001), ki-67 (P < 0.001), and axillary lymph node positivity (P ≤ 0.001). In multivariate regression analysis, there was significantly higher SUVmax value in triple-negative patients after correcting for tumor size, ki-67 value, axillary lymph node status, and grade of tumor. Conclusion: High SUVmax values were noted in high-grade, high ki-67, triple-negative, and axillary lymph node positive tumors. Whole-body fluorodeoxyglucose positron emission tomography-computed tomography (FDG PET/CT) scan is a very useful imaging modality in staging of breast cancers., FDG uptake in tumor cells is based on Warburg effect. Higher FDG uptake is noted in tumors with aggressive biology and tends to have poorer prognosis. The purpose of this study is to correlate FDG uptake in primary breast cancer with various prognostic factors. This was a retrospective study of 219 patients who underwent whole-body FDG PET/CT scan at our institute for the staging of breast cancer between January 2016 and November 2017. All the patients were histopathologically proven. Age of the patients ranged from 26 to 85 years with mean age of 54.07 ± 11.83 years. Patients have been variously categorized according to age, tumor size, histopathological type, grade, IHC, and ki-67 status. Based on age, patients are divided into two groups: <40 and ≥40 years. Based on tumor size, patients are divided into two groups: <2 cm and ≥2 cm. Totally 213 patients underwent IHC. Totally 197 patients underwent ki-67 status of tumor. Estrogen and progesterone receptors status was considered as positive with 10% as cutoff. Patients were divided into four IHC types: Luminal A, Luminal B, triple negative, and HER2neu positive. ki-67 <14% was considered as low and ≥14% as high. Whole-body FDG PET/CT scan images were acquired from the vertex of the skull to mid-thigh on GE discovery STE scanner with 16 slices CT. Before injecting 5.18 MBq/kg of 18F-FDG, the patient fasted for minimum of 6 h and blood sugar levels were <150 mg/dl. Patients were instructed to avoid muscular activity. Three dimensional PET acquisition was done with 3 min/bed. CT transmissions maps were used for attenuation correction. PET images were reconstructed using optimum subset expectation maximization algorithm. Images were displayed and interpreted in ADW 4/4.5 workstations. The region of interest was drawn around the lesions manually. FDG PET/CT scans were interpreted by two experienced nuclear medicine physicians. Maximum standardized uptake value (SUVmax) value of primary breast mass was measured. Mean SUVmax values (±standard deviation) were calculated in different subgroups as described. Univariate regression analysis was performed using SPSS Statistics for Windows, Version 21.0. IBM Corp; Armonk, NY to find out any significant difference in SUVmax in the subgroups. The subgroups having significant difference were included in the multivariate regression analysis. P < 0.05 was considered statistically significant. The age of the patients ranged from 26 to 85 years with mean age of 54.07 ± 11.83. SUVmax ranged from 1.4 to 37.7 with mean SUVmax of 11.39 ± 6.05. The mean SUVmax values for various subgroups have been depicted in [Table 1]. A univariate analysis was performed in these same set of subgroups [Table 1]. A statistically significant difference was noted in the following subgroups: grade of tumor, different IHC types, hormone receptor status, ki-67 status, size of tumor, and axillary node status. Triple-negative patients have significantly higher SUVmax value compared to patients with other IHC subtypes. 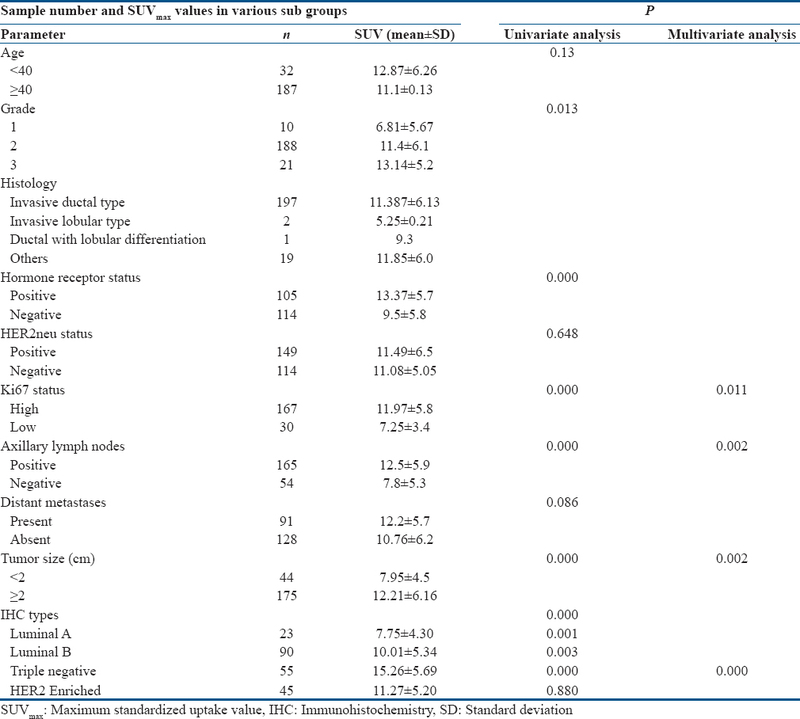 On multivariate regression analysis [Table 1], there was significantly higher SUVmax value in triple-negative patients after adjusting for tumor size, histopathology grade, high ki-67, and axillary lymph node status (P < 0.0001). Breast cancer is a very heterogeneous type of tumor in terms of pathology, tumor biology, and clinical response to therapy. Preoperative prognostication is very important as tumors with poor prognosis can be down staged with neoadjuvant chemotherapy, and breast conservative surgery may be planned. There are several well-established prognostic factors in breast cancer which include tumor grade, pathological type, IHC type based on receptor status, HER2neu status and ki-67 levels, axillary lymph node status, and distant metastases. FDG PET/CT scan is useful in staging ,,, early response assessment, restaging, and prognostication of breast cancer., FDG uptake in tumor can be expressed by simple quantitative parameter like SUVmax. In current study, metabolism of breast cancer was correlated with tumor size, histopathology grade, high ki-67, triple-negative IHC, and axillary lymph node metastases. These results are similar to the previously published studies.,,,,, Since most of the tumors were of ductal type (n = 197) in our study, a correlation between SUVmax and different histological types was not performed. There is statistically significant difference in SUVmax values in patients with different IHC types with Luminal A having least value followed by Luminal B, HER2 enriched, and highest in triple-negative patients [Figure 1]. Among Luminal B patients, those with HER2 positivity have higher mean SUVmax compared to those with HER2 negativity (11.1 vs. 9.6), although sample number in each group is not enough to have sufficient statistical power. Has Şimşek et al. in their retrospective study that included 436 patients showed that there was significant difference in SUVmax value between HER2-positive and-negative patients. In the present study, there was no significant difference in SUVmax value between HER2-positive and -negative patients. The apparent difference in study by Has Şimşek et al. may be related to other confounding prognostic factors. Mean SUVmax values of different IHC types in the present study were comparable to the values in study by Has Şimşek et al. Basu et al. in their study that included 62 patients (18 triple negative and 44 nontriple negative) found that there was significantly higher SUVmax value in triple-negative tumors compared to nontriple negative tumors. In the present study, also triple-negative tumors have significantly higher tumor metabolism compared to nontriple negative tumors. Axillary lymph node metastases are considered as the most important prognostic factor in breast cancer. In our present study, patients with positive axillary lymph nodes showed higher SUVmax value compared to patients with negative axillary lymph nodes. Although some studies show a correlation between SUVmax value and distant metastases, the present study does not reveal any statistically significant difference. Since this is a retrospective study, it may be subjected to selection bias. SUVmax value in FDG PET/CT scan is independently associated with large tumor size, triple-negative status, high ki-67, and axillary lymph node positivity. Siegel RL, Miller KD, Jemal A. Cancer statistics, 2017. CA Cancer J Clin 2017;67:7-30. Anders CK, Johnson R, Litton J, Phillips M, Bleyer A. Breast cancer before age 40 years. Semin Oncol 2009;36:237-49. Goldhirsch A, Wood WC, Coates AS, Gelber RD, Thürlimann B, Senn HJ, et al. Strategies for subtypes – Dealing with the diversity of breast cancer: Highlights of the St. Gallen international expert consensus on the primary therapy of early breast cancer 2011. Ann Oncol 2011;22:1736-47. Bauer KR, Brown M, Cress RD, Parise CA, Caggiano V. Descriptive analysis of Estrogen receptor (ER)-negative, progesterone receptor (PR)-negative, and HER2-negative invasive breast cancer, the so-called triple-negative phenotype: A population-based study from the California cancer registry. Cancer 2007;109:1721-8. Dent R, Trudeau M, Pritchard KI, Hanna WM, Kahn HK, Sawka CA, et al. Triple-negative breast cancer: Clinical features and patterns of recurrence. Clin Cancer Res 2007;13:4429-34. Crippa F, Agresti R, Seregni E, Greco M, Pascali C, Bogni A, et al. Prospective evaluation of fluorine-18-FDG PET in presurgical staging of the axilla in breast cancer. J Nucl Med Off Publ Soc Nucl Med 1998;39:4-8. Koolen BB, Vrancken Peeters MJ, Wesseling J, Lips EH, Vogel WV, Aukema TS, et al. Association of primary tumour FDG uptake with clinical, histopathological and molecular characteristics in breast cancer patients scheduled for neoadjuvant chemotherapy. Eur J Nucl Med Mol Imaging 2012;39:1830-8. Warburg O. On the origin of cancer cells. Science 1956;123:309-14. Manohar K, Mittal BR, Bhoil A, Bhattacharya A, Singh G. Role of 18F-FDG PET/CT in identifying distant metastatic disease missed by conventional imaging in patients with locally advanced breast cancer. Nucl Med Commun 2013;34:557-61. Schirrmeister H, Kühn T, Guhlmann A, Santjohanser C, Hörster T, Nüssle K, et al. Fluorine-18 2-deoxy-2-fluoro-D-glucose PET in the preoperative staging of breast cancer: Comparison with the standard staging procedures. Eur J Nucl Med 2001;28:351-8. Yararbas U, Avci NC, Yeniay L, Argon AM. The value of 18F-FDG PET/CT imaging in breast cancer staging. Bosn J Basic Med Sci 2018;18:72-9. Hatt M, Groheux D, Martineau A, Espié M, Hindié E, Giacchetti S, et al. Comparison between 18F-FDG PET image-derived indices for early prediction of response to neoadjuvant chemotherapy in breast cancer. J Nucl Med 2013;54:341-9. Aukema TS, Rutgers EJ, Vogel WV, Teertstra HJ, Oldenburg HS, Vrancken Peeters MT, et al. The role of FDG PET/CT in patients with locoregional breast cancer recurrence: A comparison to conventional imaging techniques. Eur J Surg Oncol 2010;36:387-92. Oshida M, Uno K, Suzuki M, Nagashima T, Hashimoto H, Yagata H, et al. Predicting the prognoses of breast carcinoma patients with positron emission tomography using 2-deoxy-2-fluoro[18F]-D-glucose. Cancer 1998;82:2227-34. Groheux D, Giacchetti S, Moretti JL, Porcher R, Espié M, Lehmann-Che J, et al. Correlation of high 18F-FDG uptake to clinical, pathological and biological prognostic factors in breast cancer. Eur J Nucl Med Mol Imaging 2011;38:426-35. Viale G. Integrating molecular profiling, histological type and other variables: Defining the fingerprint of responsiveness to treatment. Breast 2009;18 Suppl 3:S32-6. Koo HR, Park JS, Kang KW, Cho N, Chang JM, Bae MS, et al. 18F-FDG uptake in breast cancer correlates with immunohistochemically defined subtypes. Eur Radiol 2014;24:610-8. Wang CL, MacDonald LR, Rogers JV, Aravkin A, Haseley DR, Beatty JD, et al. Positron emission mammography: Correlation of estrogen receptor, progesterone receptor, and human epidermal growth factor receptor 2 status and 18F-FDG. AJR Am J Roentgenol 2011;197:W247-55. Kim BS, Sung SH. Usefulness of 18F-FDG uptake with clinicopathologic and immunohistochemical prognostic factors in breast cancer. Ann Nucl Med 2012;26:175-83. Vinh-Hung V, Everaert H, Lamote J, Voordeckers M, van Parijs H, Vanhoeij M, et al. Diagnostic and prognostic correlates of preoperative FDG PET for breast cancer. Eur J Nucl Med Mol Imaging 2012;39:1618-27. Has Şimşek D, Şanli Y, Külle CB, Karanlik H, Kiliç B, Kuyumcu S, et al. Correlation of 18F-FDG PET/CT with pathological features and survival in primary breast cancer. Nucl Med Commun 2017;38:694-700. Basu S, Chen W, Tchou J, Mavi A, Cermik T, Czerniecki B, et al. Comparison of triple-negative and estrogen receptor-positive/progesterone receptor-positive/HER2-negative breast carcinoma using quantitative fluorine-18 fluorodeoxyglucose/positron emission tomography imaging parameters: A potentially useful method for disease characterization. Cancer 2008;112:995-1000.